The study area is the city of Porto, which has around 42km2 and a population around 220000 inhabitants. Porto is the second largest city in Portugal, located in the northwest of Continental Portugal, limited by the Atlantic Ocean in the west and by the Douro River estuary in the south. Despite the awareness of some authorities and the growing popularity of green roofs currently in Portugal, no city has green infrastructures (GI) policies included in their legislation. The “Fifth Façade Project” (PQAP) was deve­loped in response to this gap as a partnership between the Portuguese Association for Green Roofs (ANCV) and the Porto City Council (CMPorto). The main objective of this innovative con­sultancy project is to define which models the Porto City Council should follow in order to include GI, in particular green roofs, into the urban plan­ning, environmental and green spaces strategy of the city. In order to achieve the objectives mentioned above, the PQAP Project adopted a methodology that includes the participation of research groups from different national institutions of high education, as well as interaction with foreign cities, community associations, a detailed literature review on the sub­ject and the project of green roof for three municipal buildings. To find the best strategy for Porto many studies are currently being developed within the PQAP project, such as the potential of the city buildings to receive green roofs. One very good example of a green roof in Porto is the “Praca de Lisboa”, created by the Portuguese studio Balonas and Menano Architects. This project was completed in 2013 as an effort to improve an area in decline in the middle of Porto by creating a space for community. It is an urban regeneration project of a 5,000 m2 area, taking over one of the oldest areas of the city. The structure includes three levels, with its top-most level consisting of a green roof planted with olive trees referencing the "Porta do Oliva". The middle level is dedicated to commercial use, and the ground level provides room for a refined parking lot and pedestrian spaces. The proposed solution is based on the principle that the square/ public space should adopt an open shape to the city drawn for pedestrians. It is both an urban garden and a building with a semi-covered commercial street. 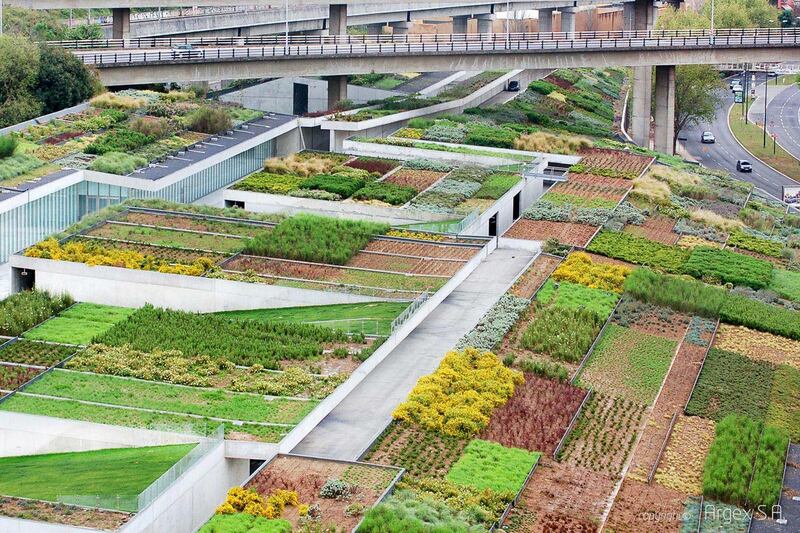 Green roofs can add value to urban environ­ments, when part of cities’ green structure. Precipita­tion retention, peak flood delay, the creation of biodiversity niches, carbon dioxide uptake and oxygen production, associated with the improvement of the urban landscape and valorisation of buildings, are just few of the benefits. Once the analysis is completed a set of useful documents synthesizing all the information will be developed. These documents will define the main guiding lines that will help to create the final strategy for the city of Porto. In this phase of the “Fifth Façade Project” (PQAP), a large amount of information is being analysed in order to understand the state of art of the topic, and select all the relevant materials to its development. - Definition of research institutions that could work in the studies within the PQAP.